When shopping for the best gas chainsaw as a homeowner your needs are far different than what a professional requires. What you want is a good well-rounded chainsaw that can tackle a variety of different projects but not too large, complicated or expensive. The five chainsaws I’ve outlined in this article will give you the versatility, power and reliability you need to accomplish your project goals without breaking the bank. To decide upon the best gas chainsaw you first have to spend a little time to learn some of the basics about chainsaws. Unlike some power tools, chainsaws are a little more complex than the average tool. More importantly, they’re dangerous if not used with care, attention and a strong commitment to following safe operating procedures. My point is that if you’re new to chainsaws then you should begin learning the basics by reading my Chainsaw Buying Guide. On the other hand, if you already know and understand how to use a chainsaw then I’m certain you’ll find this article useful in helping you decide which is the best gas chainsaw for you. If you’re reading this article I can only assume that you have work to do and want to make a smart decision regarding which gas chainsaw to buy. For new chainsaw owners my buying guide will provide you with the knowledge you need and steer you in the right direction. Let’s face it, everybody has an opinion on the best gas chainsaw. I guarantee that if you polled ten chainsaw users and asked them, “What’s the best gas chainsaw?” they’d all have a different answer. The best gas chainsaw is the one you’re comfortable with, is dependable and has well-engineered safety features. Finding the best gas chainsaw can often feel overwhelming because there’s so much information to sift through and there’s so much noise online you have to make sense of. I’ve compiled a list of some of the best gas chainsaws that you can buy online and reviewed them to help you select the right chainsaw for whatever project you’re working on or intend to work on in the future. I’m confident you’ll find a gas chainsaw on this list that will effectively allow you to accomplish your home projects without breaking the bank. Best gas chainsaw for the money. The Remington RM5118R is an excellent beginner saw but I will start by saying that it’s on the heavy side at 17.5 lbs, but if you’re in good shape then don’t let that turn you off. If you’re smaller and not as capable then this is probably not the right chainsaw for you, but any of the other chainsaws on this list will be a better choice for you. An excellent all-round gas chainsaw for the average homeowner.This saw has excellent power and very fast cutting speeds allowing it to cut through wood effortlessly and efficiently, which is a good thing, right? After all, that’s why you’re buying a chainsaw. Lots of power for heavy-duty cutting. This is a very inexpensive gas chainsaw and I’m impressed that it comes with high-quality anti-vibration handles. This is important, especially on a powerful chainsaw where vibration can be a health risk. Using power tools with excessive vibration can cause hand-arm vibration syndrome. Thankfully, the Remington Rodeo has good anti-vibration handles, making using this saw comfortable in your hands and ideal for extended use — although, I still recommend anti-vibration gloves as an extra measure of protection. You can never be too safe. Always follow the proper safety procedures when using your gas chainsaw. Remington also makes a larger version of the same chainsaw called the: Remington RM5520R Rodeo Pro. It has a 20″ bar and chain coupled with a slightly more power 55cc engine. But, for whatever reason, this particular model isn’t as good so I can’t recommend it. Ideal for cutting firewood, trimming medium to large trees, and tackling yard and storm debris. Comes fully assembled. This Remington RM5118R is one of the best chainsaws you can buy, especially if you need power and your budget is limited. Made with die-cast chassis. High-quality components. The only real negative thing I can say about this chainsaw is that it’s heavy. It weighs 17.5 lbs so this isn’t a gas chainsaw for the weak. You need to be strong and healthy to use this chainsaw. At this weight, it’s not suitable for pruning. Sure, you can trim a few branches here and there but it won’t be long before your arms get tired. 18-inch low-kickback bar with sprocket tip and chain. Front and back anti-vibration handles for comfortable operation. Die-cast chassis and pro-grade crankcase and sprocket. Electronic ignition for reliable starts in all conditions. Adjustable automatic oiler provides constant lubrication. Large bucking spikes for controlled cutting. Heavy duty case included to protect your investment. Definitely one of the best gas chainsaws if you’re on a budget. It’s heavy but built like a tank. Make sure you’re strong if you intend to use this saw, it does require a little muscle to handle it safely. Husqvarna is hard to beat for quality and value. An excellent all-around Husqvarna gas chainsaw with enough power to tackle light duty projects around the house. It’s lightweight at 10.3 lbs allowing you to comfortably use over extended periods of time without feeling fatigue. Also, it has excellent anti-vibration technology, which is an essential component of any quality chainsaw. Husqvarna never disappoints when it comes to features and ergonomics, and the 445 is no different. Easy to start and extremely durable with a chain that cuts exceptionally well, I’m certain this saw will handle all your clean-up work around the house, and more. If you’re not cutting hardwoods, such as, maple, balsa, oak, elm, mahogany, and sycamore then this is an excellent choice for your home projects. The 445 proved to be our most aggressive cutter. Just give it full throttle and let it pull its way through the log—that’s how it clinched the Firewood Champ title. Its XTorq engine evacuates the spent fuel–air mixture with a burst of fresh air, instead of the incoming fuel–air mixture. This gives the saw clean emissions, good fuel economy, and a pleasing torque curve. We also liked its crisp chain brake, side-mounted chain tension screw, and compression-release button for smooth and easy starting. LowVib : Effective anti-vibration dampeners absorb vibration, sparing the user’s arms and hands. Air Injection : Centrifugal air cleaning system for reduced wear and longer operating time between filter cleanings. X-Torq : Deliver lower fuel consumption and reduced exhaust emission levels in accordance with the world´s most stringent environmental regulations. Felling marks : Distinct felling marks for better felling precision. Combined choke/stop control : Combined choke/stop control allow for easier starting and reduce the risk of engine flooding. Side-mounted chain tensioner : Side-mounted chain tensioner makes chain adjustment quick and easy. Visible fuel level : Transparent fuel indicator makes it easy to check fuel level. Easy to start : Combined start/stop switch, Smart Start® and fuel pump make the saw very easy to start. Three-piece crankshaft : Forged three-piece crankshaft for maximum durability for the toughest applications. Smart Start : The engine and starter have been designed so the machine starts quickly with minimum effort. The Husqvarna 450 is an exceptional all-round gas chainsaw for anyone who values professional qualities in an affordable chainsaw. This might be the best gas chainsaw on the list as far as performance-to-price ratio goes. Most people will appreciate at how easy it is to start and it’s low emissions thanks to Husqvarna’s proprietary X-Torq technology. This is an extremely well-balanced chainsaw that’s relatively lightweight at 10.8 lbs, and comfortable to work with all day long thanks to the overall design and anti-vibration technology it uses. This chainsaw is great for medium duty cutting, and perhaps the best all-around gas chainsaw for the average homeowner. It seems to hit that sweet spot where it’s not to light and not too heavy. 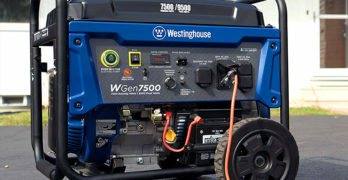 It’s got enough power to tackle most home projects but not so powerful that it overwhelms you. It feels just right and the price is reasonable for the amount of productivity you’ll get from it. The 450 loves to tear through wood as it does so effortlessly. A true workhorse with ample power to tackle those cleanup jobs that require a durable chainsaw. This is a highly reliable saw that performs extremely well and gets the job done. What more can you ask for. Ergonomic rear handle : Increased comfort with soft inlay, ergonomic trigger and asymmetrical handle. Auto return stop switch : Stop switch automatically resets to the ON position for trouble-free starting. Fuel pump : Fuel pump designed for easy starting. A well-constructed and durable gas chainsaw. Tanaka is probably not a name you associate with chainsaws but don`t be alarmed, they have a long history and have been in business since 1918 and manufacture a wide range of power tools and equipment, with a reputation for creating reliable and durable products. And because Tanaka is not a well-known brand you get more value for your money. The Tanaka TCS40EA18 is a highly versatile chainsaw; perfect for homeowners who are looking for an efficient, reliable and well-built saw for general use, such as firewood cutting, limbing, tree felling and cleaning up around the yard. It’s a powerful gas chainsaw that makes cutting a snap for all your needs around the house. Backed by a seven-year consumer warranty. When used in non-rental commercial applications, the saw is covered by a two-year warranty. When used in rental applications, it is covered by a one-year warranty. Tanaka is a brand within the Hitachi Power Tools Group and this is one the best gas chainsaws you can purchase for a reasonable amount of money. They’re also a fantastic manufacturer of top handle chainsaws. The Husqvarna 440E is similar to the Husqvarna 435 with a few exceptions. Slightly heavier at 9.78 lbs, it has Smart Start, which is a Husqvarna proprietary technology that allows the engine to start quicker than usual. And the second main advantage is the tool-less tensioning, which just means that you don’t need to use and external tool when adjust or tightening the chains. I definitely consider this to strike a nice balance between price, power, weight, quality and with a 16″ bar and chain, making it a worthy contender for the best chainsaw, but all the saws on this list are well-engineered, well-reviewed, have great safety features, and worth every penny they cost. This is a fantastic lightweight chainsaw with an excellent cutting chain that performs extremely well. A nice all-around saw and great for beginners. Fully capable of tackling jobs around the home with ease. Excellent for a beginner chainsaw buyer. Lots of power for your home projects and also easy to maneuver and comfortable to hold due to its lightweight and good design, allowing for a balanced saw that fits comfortably in your hands. Husqvarna chainsaws are known for their quality and although their name might sound funny – it’s a Swedish company – they are the biggest manufacturer of power equipment in the world. Husqvarna is a name you can trust and a maker of exceptional quality gas chainsaws. As you’ll notice there are several Husqvarna chainsaws on this list. The reason: they make some of the best gas chainsaws that money can buy. Tool-less chain tensioning : Quick and easy chain tensioning and assembling of the bar and the chain without using any tools. The main difference between the Husqvarna 450 and the Husqvarna 450E is the 450E has a tool-less tensioning system, which means you don’t need an external tool to adjust your chain. It’s an extremely useful feature that simplifies your life so you don’t have to worry about having your tightening tool with you wherever you go. It’s a feature of convenience that you will appreciate over time. It’s slightly heavier than the 450 at 11.3 lbs but all the same quality and functionality remains the same. As far as convenience goes I’d much prefer the tool-less chain tensioning but that’s just my own personal preference as I appreciated easy-to-use tools and products. An excellent all-around gas chainsaw with enough power to get the job done around your home that will surely last you for many years if taken care of and maintained. Any of the saws in this list are good quality saws and the reason why they’re included in my recommendations. Sure, there are a few differences here and there but for the average homeowner any of these saws will satisfy your needs and the Husqvarna 450E is no different. You can’t go wrong with Husqvarna. I hate to sound like a broken record but the 450E is one of the best gas chainsaws you can spend your money on. How do you decide upon the best gas chainsaw? First, you need to know how you plan on using the chainsaw. The Husqvarna chainsaws cost a little more but it’s a very reputable brand. You can’t go wrong with Husqvarna, but I will say that you get better value with the Tanaka TCS40EA18 or the Remington RM5118R gas chainsaws on this list. Nothing beats the power, speed and versatility of a gas chainsaw when it comes to tackling tough jobs around the home, or on the job, if you’re a professional. The best gas chainsaw for you will depend on the size of wood you need to cut, the type of wood (hard vs soft) and your physical strength. Always read the owner’s manual before operating your saw. Also, if you’re new to chainsaws consider taking a local chainsaw training course. Most major cities or towns likely have a course for you to attend. Always follow proper safety procedures when operating a chainsaw; read my article on: Chainsaw Safety Tips. If you’re doing relatively light-duty cutting with small trees with the occasional need to cut medium-sized trees an electric chainsaw might be a better bet. In addition, electric chainsaws are great for pruning. They’re not as powerful as gas, and lag behind when it come to speed and durability but they’re good for small jobs and perfect for occasional chainsaw usage. Read my article on electric chainsaw to find the best chainsaw for your project: Best Electric (corded) Chainsaws. If you’re looking for a chainsaw with complete freedom and mobility, without the hassle of an extension cord then you should read our Best Battery Powered Chainsaw Guide. You may also be interested in reading about top handle chainsaws if you need to work from an elevated position or perhaps the practical Black and Decker Alligator lopper is the right tool for you — a great alternative to chainsaws for cutting branches under 4 inches.